Should we give up the mega-commute or fix our over congested roads properly once and for all? In Melbourne, if you drive a car it is possible to travel 10 times further than someone taking the train or tram would travel in the same amount of time. At night, the difference becomes even bigger, when road congestion eases and public transport becomes less frequent. It is a situation replicated across Australia and it's little wonder Australians love their cars. I've been doing the mega-commute from the Central Coast to Sydney for about 9 years now. I used to drive but then changed to public transport for a few reasons and it's not to say that public transport is the better choice as it clearly is not. More often than not, congestion over the harbour bridge was enough to delay my trip by about 40 minutes in the mornings. 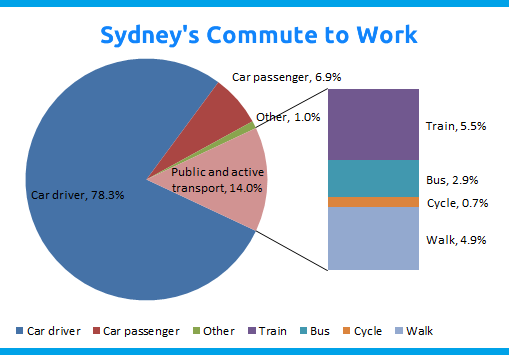 More cars on the road is not scalable without building more road infrastructure, it only adds time to the daily commute and building high density city living areas does not suit the majority of Australians. Trains are very much over crowded now, adding more people to the train system will be shifting the problems to train chaos. The train network needs to be built with failover in mind, alternate tracks so we stop avoiding the domino effect. I know plenty of people including friends who live 20 minutes out of the city near work. But ask them why it takes them the same 1.5 hours to get into work and the same 1.5 hours back home. It's simply congestion and poorly designed roads. "The solution may seem simple but it's something that's likely to cost billions and take years to develop. It's probably suitable as a 20 year plan to any reasonable Government." To solve problems now I firmly believe that people need to embrace rideshare and try to ensure 3 people to a car. The impact of potentially removing the need for 1/3 of the cars on the morning and evening commute would be huge. The problem is the amount of cars not people, if 10,000 people decided to rideshare we would notice results.